That’s the question my friends and colleagues posed—sometimes with a shudder—when I told them I was off to see United 93, the story of the one hijacked flight on September 11 that did not hit its intended target, in the U.S. capital, but crashed in a field in Pennsylvania, killing all aboard. The trailer was pulled from several New York theaters after complaints from moviegoers. Leaving aside that the trailer was doing what all trailers do—trying to sell the movie—there is the larger matter of whether Hollywood can be trusted to treat this issue responsibly, to take dramatic liberties with real people, many of whose names are read every year at 9/11 memorial services. That, in any case, was what I said before I sat through United 93. Now I’m not so nonchalantly Nietzschean. It’s a terrible ordeal—precisely because, in a sense, it is not framed. The director, Paul Greengrass, began his career making documentaries and now makes the world’s most documentary-like docudramas. His 2002 film Bloody Sunday traces the course of the Irish civil-rights march in 1972 that ends in massacre, and it’s shot with handheld cameras, like a piece of combat photography. At a time when even hack thriller filmmakers employ vérité techniques to give their material a You Are There charge, Greengrass has the discipline and craft to make the illusion take hold. In United 93, it is the morning of September 11, 2001; the action unfolds in something close to real time; and we are ten steps ahead of a tragedy that we’re unable to change. The movie is as much journalism as art: It’s about how things work—and, on this day, how things don’t work. After a prologue in which four Muslim men pray fervently as the sky lightens outside their cheap motel, Greengrass launches into a long and torturously mundane section in which crew members and passengers arrive at Newark (where United Airlines Flight 93 would originate), and the day shift begins at the control centers in Boston, New York, and Herndon, Virginia (the operations base of the FAA). Flight attendants prepare United 93’s cabin. The co-pilot does a “walk-around” to inspect the exterior. Onboard, an old woman asks for water, explaining that she needs to take her pills. A guy almost misses the plane, dashing in just before the cabin door closes. With events as well known as these, Greengrass doesn’t need to sensationalize. The film is more powerful when he un -sensationalizes. When Boston loses contact with American Flight 11, the air-traffic controller calls again and again for a response. He doesn’t yet know what’s happening, but we do—and it’s chilling to stare at that tiny icon on the radar. If you see United 93 in a theater with a decent sound system, you’ll notice in the control-center sequences a continuous hubbub in the side speakers. On at least two occasions I turned in annoyance, tempted to go out to the lobby and hush the inconsiderate crowd. But the ubiquitous racket—the busyness, the swerving camera—is part of Greengrass’s strategy. Everything is moving very, very fast and at the same time, in the slowest slow motion. It’s a frantic paralysis. And it’s excruciating, because there are no clear lines of communication. The commander of the Northeast Air Defense Sector has only four planes at his disposal and can’t get permission to engage the hijackers because he can’t find the president. (Greengrass is too classy to cut to George W. Bush reading a story about a pet goat, but I am not too classy to refrain from bringing it up.) The principal source of information seems to be CNN. (The Towers are seen only on TV and in the far distance from Newark.) By the time the military jets arrive, it’s all over. Which brings us to United 93, bound for Washington—and it’s in this context that the heroism of the passengers emerges. They were the first and last line of defense. In the absence of direction, they figured out what to do as it was all going down. They didn’t necessarily risk their lives to save people on the ground. They realized, from cell-phone calls to their loved ones, that rushing the cockpit was their only shot at saving their own lives. 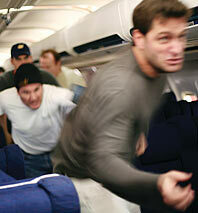 But merely to act: United 93 shows how terrifying, how grueling that can be. No one on Flight 93 is exalted. They are all human. And so, for that matter, are the hijackers. Has Greengrass and his research team gotten the details right, given how little we know—except through cell-phone calls—of what happened in the cabin? The cockpit recording that was played at the Zacarias Moussaoui hearing reveals that the filmmakers left out—either by ignorance or design—some of the more painful sections, among them a moment in which one of the pilots begs for his life. Mercifully, Greengrass doesn’t dwell on the graphic details. The murders of passengers, pilots, and a flight attendant happen at the margins of the screen. Because we’re prepared, and somewhat inured to violence in movies, these acts are easier to take than the many references, idle and, later, not so idle, to the children and babies of the people onboard. Many family members were involved in helping Greengrass’s fine actors (some of them actual pilots and flight attendants) compile dossiers on the people they’d be playing. Every close-up of a passenger crying, praying, or resolving to take matters into his hands has weight—as if the filmmakers understood that loved ones would be watching. At the same time, no one on Flight 93 is exalted. They are all human. And so, for that matter, are the hijackers. They are not portrayed as evil cowards but as deeply religious men driven to (or brainwashed into) committing the most despicable acts imaginable. What makes that important to register is that evil cowards can be defeated far more easily than people deluded into thinking that God is on their side. In my press notes, the excellent actor Christian Clemenson invokes Tolstoy’s conviction that the aim of art is to state the question clearly—not to provide answers. I’m not sure what that question is in United 93. There’s the obvious one about why communications broke down. There’s a question about what these hijackers looked like, how they saw themselves. And there’s the central question: With more fictionalized 9/11 films to come, including one by Oliver Stone, is it too soon? My answer, somewhat modified from above, is that if they truly help us—as the brilliant, tightly focused, and momentous United 93 helps us—to fill in the gaps in our knowledge and to pose more incisive questions, then it is not soon enough.